When to drink your teas light and strong? My observation is females drink their teas light while males drink them strong. Other than the fact that men want to be perceived as macho men, less of a wimp, it has a lot to do with life style. Strong tea can clear excessive body heat, detox, nourish lung, clears mucus, induce urination, help digestion of fatty food. These are not the only health benefits of tea, but the part that many males need to counteract the effect on their bodies due to living habits. Males tend to drink more alcohol, smoke more, eat more meat than females. Strong tea can sober up a drunk fast, caffeine also signals kidneys to eliminate urine and toxin. Iced tea season is here. As temperature arises, Americans are drinking more iced teas. Bottled tea sale is surging as the temperature. Some discriminated drinkers prefer fresh made iced tea. For those whom are used to drinking high quality tea hot mostly, iced tea on the market or even fresh made from tea bags in a big iced tea maker just won't cut it. I made iced Phoenix oolong tea from commercial grade Dan Cong leaves, the result turned out quite nice. You can add cold water if too strong. The aroma is long lingering in mouth, a little bitter at first, then turn into sweet after taste quickly. The fragrance is amazingly long lasting in mouth. Every breathe you take is aromatic from the first gulp and on. Phoenix tea is difficult to brew hot, especially commercial grade. However cold brew seems to be bullet proof. You can brew it strong, with a little extra cold water, it'll taste wonderful again. If you were a sun tea drinker, this may not be your cup of iced tea. For those whom with a palate for hot tea (not the cream and sugar type), this is a refreshing tea in a hot day next to a barbecue. Eastern Guang Dong province, China contains a terrain of mountains connecting one and other, among them are rivers and valleys. Phoenix Mountain has long been the home of tea plants before 0 AD. A tribal group named Lei Zu lived among Phoenix Mountain for centuries, their primary economy resource was cultivation, tea was a major part of their lives. During Sui dynasty (589 - 618 AD), a massive earthquake cause major wild fire which burnt down most of the plantations including tea trees in the area, only a couple of mountain tops escaped such tragedy, one of them is the now famous Wu Dong Mountain. Part of the Lei population migrated east into Fujian province due to lack of food source since the wild fire. Some local tea varietals followed the migration into Fujian province. During Tang dynasty, 780 AD, Cha Jing (Tea Classic) already documented tea from Chao Zhou Phoenix mountain. Teas from this region became tribune tea to royal families since for many dynasties to come. Deng Siao Ping favored Phoenix teas during his reign. Today, the term Song (dynasty) is often seen associated with Phoenix tea, why does it seem like Song dynasty was the beginning of Phoenix tea, when in fact tea history went much further back in time? We can say Song dynasty was the corner stone for future development and spread of Phoenix tea. The beginning of Southern Song dynasty, the entire central government migrated to the south, expanded to Hang Zhou, Wen Zhou and Fu Zhou (now Fujian). With such large populated migration, came with the central China culture, art, science and skills fueling the economy expansion in the south. Southern Song was one of the most prosperous time in Chinese history. Export business began uprising at this important time, which brought in more silver and gold that required to develop extravagant hobbies. Good tea and scholars don't stay far from each other. Tea during this time reached its high point in history. The style, tea ware, daily contest and craziness were at its max. Migration didn't stop there, many Hans moved from Fu Zhou (Fujian) into Guang Dong Chou Zhou, brought oolong tea culture into the area, including the preliminary Kung Fu tea. Kung fu refers to 2 concepts, the processing of oolong tea which takes kung fu (skills) and time, and brewing oolong tea also requires kung fu and time. Given the natural resource of Chao Zhou, kung fu tea culture was refined here for the next few centuries. Chao Zhou local dialect and Min Nan (Southern Fujian) dialect belong to the same Chinese language branch, not the Cantonese language branch even though Chao Zhou is part of Guang Dong, which proves the historical fact of such migration. Toward late Ming dynasty, China was opened to western countries for the first time, missionaries and trading posts could be found along the southern coast, Fujian and Guang Dong sea ports. Chao Zhou was economically advance at the time, foreign money fueled the extravagant tea habit even further, it's a fashionable status. Everything entailed in Kung fu tea were then fully developed. The artistic value of kung fu tea presentation were the chase of the town. Olive Pitt charcoal was only used by the rich, famous and government officials at the time and today. Others couldn't afford it, use wood charcoal. The kung fu tea culture was widely adopted by the higher up clans and the normal civilians. Ching dynasty, Dan Cong was developed with special skills. The quality of tea making reached new high, which became the foundation of today's DC. Single bush processing became the signature of Phoenix tea and highly sought after. With a few hundred years of plant and skill development, the maturity of such bushes were destined to be made uniquely. Song left major foot prints all over Chao Zhou which can be seen today, bridges, temples, stone pavements, schools, particularly central China culture reflecting Song period. Chao Zhou dialect contains some of the ancient Chinese words from the central plain which modern mandarin no longer uses in such context. Cantonese women call their husbands Lao Gong (old male) regardless of age, Chao Zhou women called their husbands 安 An (safe/peaceful), what makes a husband is having a woman under his roof, which is what the Chinese character depicted. Chao Zhou since then became birth place to many poets, (Zuang Yuen) scholars, generals, successful business men - locally and internationally. Chao Zhou business men are also called the Chinese Jews. Chao Zhou successful business men can be found in Hong Kong, Thailand, Singapore, Malaysia, Vietnam, Indonesia for centuries, and US/Europe in recent history. Some of the Forbe's 500 richest men of the world are Chao Zhou men. Kung Fu tea used to be more famous in South East Asian than in Beijing because of this world wide business expansion. Since the 90's, Kung fu tea is spreading fast and furious north ward in China, tapping into the traditional green tea regions. This momentum is slowly spreading outside of Asia in the last few years as well. Kung Fu tea has never been this recognizable in its history for the last 9 hundred years. It is a proud moment! What is the ideal habitat for tea trees? Camellia Sinensis are sub-tropical plants prefer hot and humid conditions. Tea trees start to spring out those lusious flavorful buds around 10c, slow growing under this temperature. Between 10c to 15c, leaves begin to open, around 15c to 20c, growth is fast and reaches the maximum growth when temperature is between 20c to 35c. Tea trees actually stop growing when temperature is beyond 35c. During winter, tea trees hibernate when temperature drops below 10c. As plants mutate to adopt local climates (takes up to hundreds years), different varietals has different tolerance of cold temperature. Some trees can survive in temperatures as low as -12c. Tea plants love humidity and lots of rain. An average annual rainfall of 1.5 meters or 60 inches is ideal for replenishing water content after each picking. Up to 95% of the organic materials in a tea leaf require the conversion by light. Infra red light can be easily absorbed by tea leaves, especially at elevation of 500 meters to 800 meters, clouds are dense, indirect infra red lights are best for tea plants. Leaves are tender, meaty, and highly aromatic. Direct sunlight with high temperature speeds up growth, leaves matures fast, polyphenol level increases, hence summer teas are more bitter then other seasons. 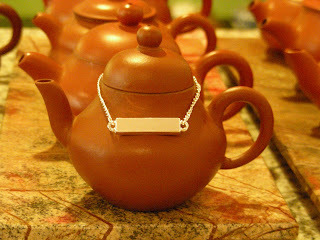 Heidi came back from a seminar and gave me this little chain as a gift along with a couple of teas. I thought it'd give my OLD fashion tea pot a modern touch. :P Thank you Heidi! I can't get over the image that a 70 years old skinny Chinese man holding a cup of tea with a big ole chain on his neck looking like Snoop Dogg, smiling with a roll of heavily tea stained teeth and 1 sparkling gold tooth. Now that's a bill board ad for Lipton iced tea at time square, New York ! The pot is a temporary gift from WY until I find something like this during my next trip to China. I am currently raising it with high fire WuYi rock tea. Every year, the World Tea Expo host a spectacular event at the east or west coast alternatively. This year is the west coast event at Las Vegas. We west coasters are happy to have such venue close to home. I will be visiting the Expo on Saturday and Sunday, 5/31-6/1. A few friends of mine are also going to attend the event, however the highlight will be getting together with tea nerds from all over the country or even all over the world to share some extraordinary teas. If you are anticipating to attend the event, we'd love to meet you there. You may email me at tea at teahabitat dot com for contact details.